"Great Assistance in Car Purchase!" We bought a low kms & much-loved very lightly used 2000 Miata MX5 and dealt with Kevin Yamaguchi and Jason Choi on a Saturday. We've had no experience with Hyundai previously but we were much impressed. Professional and friendly,...this is a top notch outfit. Winter was approaching fast and we did not require it immediately so it was shipped via Canuck Transport to Kamloops 3 weeks later. Everything was fixed as promised and they even included a brand-new 1.5 ton scissor jack but I found one in the trunk. 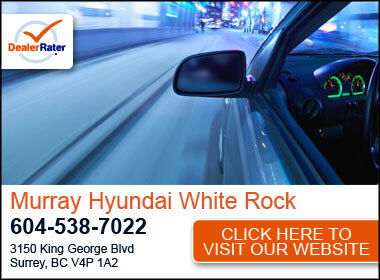 All in all, we can readily recommend Lougheed Hyundai to any lower mainland customer. FANTASTIC! We bought a used 2017 Elantra GL from Lougheed Hyundai and had a great experience. Our sales person Steve Boulay was friendly, genuine, helpful and professional from the onset when I contacted him through to the after service once we had bought the car. All the other staff especially both Financial Services Managers were great as well and seemed to really care like Steve about the job they were doing, A much difference experience than previous vehicle purchases from other dealerships over the years. "Terrible after sales customer service"
My initial experiences when purchasing a Sante Fe was positive, they were attentive and not too pushy. Unfortunately the safety inspection was not completed correctly and I had to return the vehicle two weeks later for a considerable repair. I noticed a fault during the test drive and was told it would be repaired, this unfortunately was not the case. The general manager was unwilling to acknowledge my frustration as it was considerable inconvenience for me having to visit their dealership twice after purchasing the car. To date I have yet to receive any explanation, apology or offer of compensation considering what I had to go through. The latest response I received was that because they had to repair the car they are unwilling to do anything for me to make up for the time/fuel spent bringing the car back to them so that they could correct their mistake. This after sales service is not what I expected from a registered Hyundai dealership and I considerate it completely unacceptable given the lack of care or consideration that they have offered following their mistakes. We recently bought a 2016 Hyundai Elantra from Lougheed Hyundai, and we love it! This dealership made the experience of buying a car a sheer pleasure. We came here after a negative and uncomfortable experience from another dealer, but Lougheed Hyundai was a breath of fresh air! They were willing to work with my husband and I to give us a great deal. The service we received was excellent. Monica at the front desk definitely knows how to go the extra mile for a customer, she is amazing. We are so happy we chose Lougheed Hyundai to do business with!